Last week wasn’t quite as strong as recent weeks, but at 9-7 at least it was above .500. The way things were going for a while in the early games I didn’t think that was going to be the case. This week we’ll look to give a Christmas present to ourselves by putting together a huge week of NFL office pool picks. Carolina at Pittsburgh - Carolina is coming off a win, but that was at home against a lousy team, and neither circumstance repeats itself here. The Steelers will be angry after a bad loss last week, and they know how important this game -- essentially a gimme if they keep their heads together -- is to their playoff positioning. Take the Steelers. Dallas at Arizona - This is not the thrilling package I would like to have under my tree on Christmas day. Arizona was terrible last week. Dallas wasn’t nearly as bad, though they did make Rex Grossman look much better than he has any business looking. Still, Dallas should be the clearly better team here. Take the Cowboys. New England at Buffalo - This win can guarantee New England home field advantage through the playoffs. It’s also a chance for them to put a better effort together after a flat win last week. Take the Patriots. New York Jets at Chicago - I continue to have a hard time believing in the Bears despite their 10-4 record. The Jets hardly inspire a lot of confidence recently, either. Still, the Jets are a very strong road team, and the Bears have been inconsistent at home. Take the Jets. Baltimore at Cleveland - The Ravens really need this win to have any shot at a first round bye. Cleveland has nothing to play for. Even at full effort the Ravens are clearly the better team, and they should have much more effort this time. Take the Ravens. Tennessee at Kansas City - The term must-win gets used far too often, but in this case it is very accurate. The Chargers are likely to add a win to their total this week, so the Chiefs have to do the same to stay in the front of the race for the division. The Wild Card likely isn’t an option for them, so they need to stay on top. Take Kansas City. San Francisco at St. Louis - How bizarre is it that the path to the NFC West championship quite possibly comes down to this game between 6-8 and 5-9 teams. What a horrible joke. Take the Rams. Detroit at Miami - I saw the craziest stat yesterday - The Steelers have won more games in Miami this calendar year than the Dolphins have. Ouch. Detroit has only won one road game in a much longer time frame than that, too. This certainly is not strength-against-strength. Take the Dolphins. Washington at Jacksonville - The Redskins are a mess, and the attitude around the team isn’t going to get any better this year. The Jags are a solid squad, and they still have a chance of winning their division if they keep winning. That should be all the motivation they need here. Take the Jaguars. San Diego at Cincinnati - Only one of these teams deserves to be called an NFL organization, and it isn’t the Bengals. Take the Chargers. Houston at Denver - Some team has to win this one. I couldn’t care less about which team it is. This game is just hideous. Take the Broncos. Indianapolis at Oakland - The Raiders could do the Jaguars a massive favor by coming through in this one. It’s possible, but sadly I just don’t see it happening. 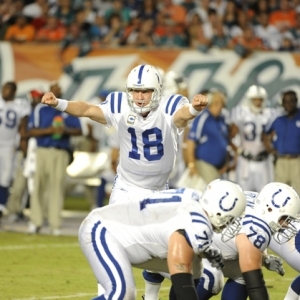 This is the time of year when Peyton Manning raises his focus to a whole other level. Take the Colts. New York Giants at Green Bay - Another ugly game with serious implications. Neither team is coming into this one off an effort they should be proud of, but the loser finds themselves in real trouble in the Wild Card race. New York has more certainty at QB, so that gives them the edge. Take the Giants. Seattle at Tampa Bay - A loss here would be a huge blow to the Seahawks and their playoff aspirations. Given the mess that their QB situation is right now and their struggles on the road, I don’t have a lot of faith in their ability to get a win. Take the Bucs. Minnesota at Philadelphia - Do you really need to think too much about this one? The Eagles are a playoff squad that is really playing like one. The Vikings are likely starting some guy named Joe Webb at QB. Webb was drafted earlier this year as a wide receiver in the sixth round. Take the Eagles. Obviously. New Orleans at Atlanta - Great, great game. Or at least it should be. The Falcons seem to have forgotten how to lose at home, and the Saints are playing very well and are a strong road team. This one really is close, but I have to take the home team. Take the Falcons. Allen Eastman is about to destroy the bookies once again this weekend with his college football bowl picks and his NFL picks. His football betting system for NFL handicapping (dubbed the 99 System) has hit nearly 70% the last three years and Eastman has four of five big winning weeks under his belt.